Participants listening a member of Tebuyoleka community sharing the identified local problems. 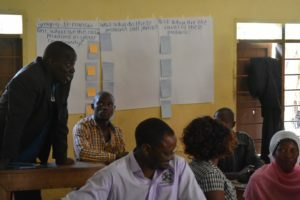 In March 2018 the local transition team in Kampala organized the first three Transition Management arena meetings engaging participants from seven communities of an informal settlement area of the city. These first community meetings aimed at supporting the selected participants to structure the problems in their communities. Participants during an open discussion. 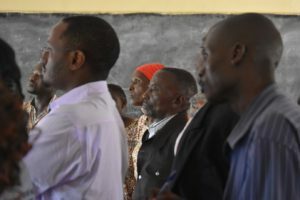 The first meeting was organized in a local school in Kabuoleka community, and 15 active community members from four local communities participated. At the beginning of the meeting the participants were shy and not sure what the meeting would be about, but they showed their interest to participate. After a short round of getting to know each other and the transition team members and after a short introduction of the T-GroUP project, the participants started to feel more comfortable to speak. 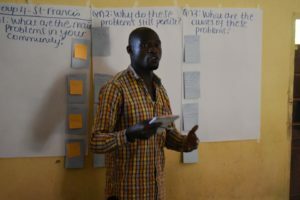 The participants were then divided into groups and went through three questions to understand the problems that they are facing in their communities and their root causes and reasons of persistency. After a first moment of hesitation, the groups started to discuss and voice their problems and write down their views. After this exercise, each group presented with a lot of energy and enthusiasm the main insights from their discussions and the other participants were invited to ask questions. Multiple problems came up. One common problem across all communities is the lack of a proper waste management contributing to water contamination, the blockage of drainage systems generating flooding and creating a very unhealthy and unpleasant environment. Other problems expressed were the improper sanitation facilities, which in their view also contributed highly to water contamination. In some communities, the participants explained that that the public toilets cannot be used anymore because the landlords take over the facilities. Looking at a deeper level of the problem, it is important to consider that the regulations regarding the building of infrastructures, housing and toilets are not respected and there is not enough control from local institutions. Other addressed points hinted at the low awareness of the inhabitants regarding waste recycling and recollection, building of sanitation facilities and water and sanitation practices. A community member of St. Francis community sharing the main insights from the group discussion. At the end of the meeting, when participants were asked what they found most useful about the meeting, some of them shared that they ‘learn a lot from each other!’. One participant said: ‘it is usually difficult to have such people from the University in our meetings’ while another shared that he understood that ‘the problems need to be solved together’. Through this first Transition Management arena meeting the participants were able to express their opinions and views and learn from each other. This allowed them to understand more in depth the causes of the persistency of their problems and to reflect on their own practices and behaviors as well as on the role of other local institutions and organizations.